TANKS BUILT TO ORDER IN 3 – 4 WEEKS. MAY 2016: WE HAVE STEEL IN STOCK. GOOD FOR 400#+ WORKING PRESSURE FOR AIR RECEIVERS UP TO 48″ IN DIAMETER. CALL OR EMAIL FOR A FAST QUOTE. 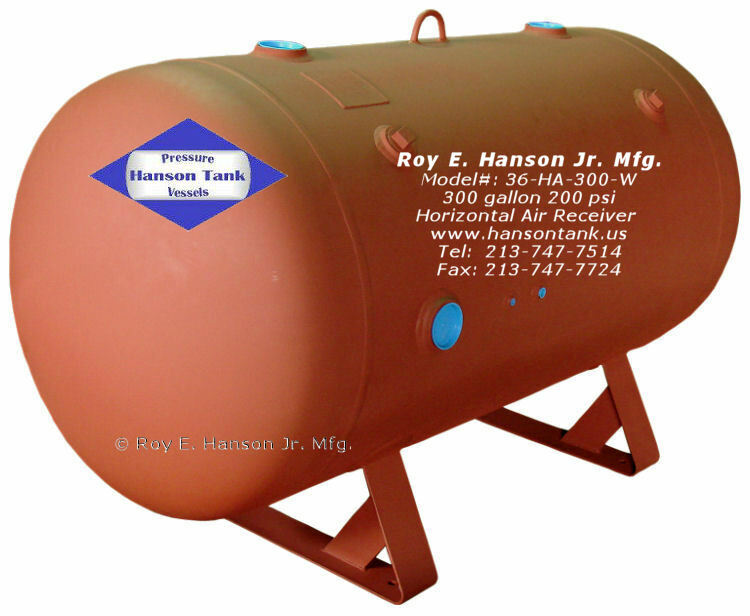 Hanson air receiver tanks are built and tested in accordance with the A.S.M.E.boiler and pressure vessel code section VIII division I for unfired pressure vessels and bear the “U” or “UM” stamp, national board number and serial number, as required. A copy of the A.S.M.E. data sheet U1A, signed by and A.S.M.E. authorized inspector, will be sent with the invoice if requested at time of order. Standard exterior paint system is power buff to SSPC-SP3 plus one coat 2/3 mil dft rust resistant primer. Special exterior and interior paint systems are available at extra cost. All FNPT tappings (“B” and “R” on drawings) and flanged openings are plugged and covered before shipment. Manway covers are installed for shipping only, and must be adjusted and tightened before the tank is pressurized. Compressor platforms on pump mount models are not drilled or slotted. Air receiver tanks are guaranteed free from defects in material and workmanship for one year from the date of shipment, FOB our factory. Full limited warranty terms are available on request.